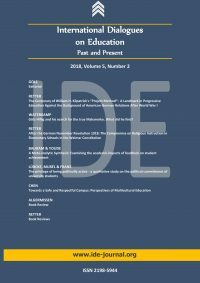 This issue aims in particular at discussing historical and current developments in pedagogical and social science research and thus literally lives up to its title: “International Dialogue on Education: Past and Present”. You will find more information about our editorial policies and guidelines at instructions to the contributors, the news and other sub-pages of our journal. The first three articles in this issue deal in particular with historical-comparative aspects of education. This is followed by three articles that focus more on current pedagogical and research methodology issues. In a final section you will find reviews of books published in 2018. The contribution by Hein Retter is dedicated to a milestone in the history of progressive education: 100 years ago, in September 1918, William H. Kilpatrick’s essay “The Project Method” was published in the USA, causing a sensation not only in America, but also internationally. Retter shows how Kilpatrick’s project method came to Germany when its popularity was already waning and criticism dominating. Retter focuses on Kilpatrick’s previously unpublished letters from 1931-34. The article deals with contemporary social backgrounds, especially the relations between American and German educators of the time. Ambivalences of Kilpatrick and John Dewey in relation to the race question in the USA are discussed. Retter critically responds to claims in the younger Germans’ reception of Dewey’s work that there was no interest at the time in Dewey, Kilpatrick and American pedagogy in the Germany of 1918-1932. Dietmar Waterkamp’s contribution is a critical-constructive examination of the work of the West German Makarenko researcher Götz Hillig (born 1938) and in this context also with different contemporary and current interpretations of the work of Anton Semjonovitch Makarenko (1888-1939). Waterkamp describes Hillig’s search for the ‟true” Makarenko and goes into the question of what Hillig found – also in the context of some controversial East-West German discussions. A look at Makarenko’s lifetime points to the majority of his writings being published during the Stalinist period of the Soviet Union. Waterkamp underlines the possibility of drawing conclusions from Hillig’s work and suggests what change in Makarenko’s image would result from Hillig’s research. Another article by Hein Retter was initially intended for the next issue, but we were able to already include it here, perhaps more fittingly, because it refers to an important historical date 100 years ago – the German November Revolution of 1918 and the following time of the Weimar Republic. Here we are particularly concerned with developments in educational policy discussion and practice. The leading political parties had completely different ideas about the role of religion in public education. Retter describes the complexity of finding a compromise from a multi-perspective view. The contribution of Nalline S. Baliram & Jeffrey J. Youde contains meta-analytical research on the academic impact of feedback on student performance. Based on Irons (2008), the authors define feedback as “any information, process or activity that enables or accelerates students’ learning, based on comments related to either formative or summative assessment activities” (p.7). The study aims to summarise quantitative research studies to further investigate the impact of feedback on university students performance. Based on their findings, the authors can show that the overall effect is moderate and statistically significant (hedges’ g = .40), which supports the idea that best practice feedback has a positive impact on academic performance. The results suggest that the content-specific feedback provided by the teacher at the K-12 level has a positive effect on student academic performance. The authors point out that further research is needed to verify the construct. Stefanie Lübcke, Fabian Mußél & Anja Franz deal with students’ problems when politically active and representing their own interests at university. This qualitative investigation of political involvement in higher education presents the most important results of research into student involvement at the Otto-von-Guericke-University in Magdeburg. The study focuses on the question of why and how students become active in university policy discussion. Semi-standardised interviews are conducted with students from different educational backgrounds. The Civic Voluntarism model of Brady, Schlozman and Verba as well as Bourdieu’s theory of capital were used to evaluate the interviews. This provides an insight into the relationship between participation-relevant resources, or capital, and political commitment. On the basis of the comparison of the interviews, hypotheses are developed that can be regarded as the results of the study. The study thus provides insight into the significance of social origin and political participation, as well as socialisation-related factors. Hsuan-Jen Chen describes ways to a safe and respectful campus and perspectives of multicultural education. For the author, a specific type of multicultural education is the essential basis for creating such a campus. The author argues that from the perspective of power relations, schools are places that help maintain existing relations by reinforcing the ideology of assimilation. One problem is that not all perspectives are evaluated. As a result, pupils who are not part of the norm are treated unfairly at school. This can have a negative effect on learning as the school is not a safe environment for them. Multicultural education must be designed to help students take multiple perspectives and learn to accept diversity. This article illustrates why multicultural issues should be examined in the context of power relations. This is followed by a critical examination of the assimilation ideology and the role of schools in this process. The author also mentions the difference between assimilation and integration and analyses how students can be endangered by assimilation processes. The article permits differentiated perspectives in dealing with the concept of multicultural education. In his review Ulf Algermissen presents a book by Olga Graumann that addresses the question of whether inclusion is an unrealizable vision. The reviewer points out that this book is not only intended for specialists in the field of special education, or for educationalists and students in general, but is also interesting for parents of disabled children to help in making a decision or choice of schools. Hein Retter reviews three publications that appeared recently: firstly, an anthology, edited by T. Jacobs & S. Herker, on the conception of historical reform pedagogy (progressive education) and the practice of Jena Plan pedagogy and its perspectives for a modern school. The reviewer deals secondly with the book by H.G. Callaway on pluralism, pragmatism and American democracy. Both books have a common point of intersection: the question of race in its different meanings for white thinking and African American thinking in the USA of the last 100 years, thus in the time of educational progressivism after 1900, the time of social constructivism from 1930, and the time of the Civil Rights Movement from the sixties until today. Retter also reviews (thirdly) the book by J. E. King & E. E. Swartz on heritage knowledge in the curriculum and calls it very encouraging for all those who continue to suffer from everyday racism in the United States. We will continue to maintain a broad thematic focus on educational developments from historical, international and comparative perspectives. Furthermore, not only educational scientists and practitioners can exchange information about their research results, but also representatives of related fields in the human and social sciences. We publish articles that are scientifically verifiable, permeated by humanistic, democratic values, social responsibility, respect for autonomy, diversity and the dignity of individuals, groups and communities. We stand for liberal, independent educational research and publication activity and against the unrestrained commercialization of access to scientific publications. Despite rising production costs for the further development of the design, the expansion of our globally operating IDE team, etc., the main editorial work remains free of charge for the authors. Authors are again requested to strictly adhere to our editorial standards and requirements in the instructions to the contributors, the continuous news and other sub-pages of the journal. Again we have good reasons to thank all those who made the publication of this issue possible through contributions, peer reviews, translations, corrections, editorial and electronic-technical work. And again we thank our cooperation partners at the College of Education, National Chengchi University and the Institute of Guanxiology Studies, both Taipei (Taiwan), the School of Education at Seattle Pacific University, Seattle (USA), and the Society of Friends and Supporters of Otto-von-Guericke-University Magdeburg (Germany) for their continued support.